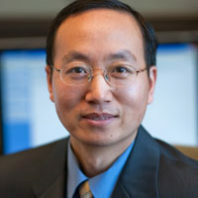 Dr. Hanwu Lei, Assistant Professor of Biological Systems Engineering received the Early Career Award from the Association of Overseas Chinese Agricultural, Biological, and Food Engineers (AOCABFE) in 2014. The purpose of this award is to recognize outstanding career achievement by a young AOC member in the profession of Agricultural, Biological and Food Engineering. The award is to honor achievement through education, research, innovation, development, extension, consulting, administration, international collaboration, and other professional activities. AOC is a professional organization of hundreds members from all over the world. The regular members are composed of university faculty members, post graduated research associates, and professionals working in government agencies, research institutes and industry. AOC has become a well-recognized professional society in worldwide biological, agricultural, and food engineering.